Electronic objects are not only "smart", they "dream" in the sense that they leak radiation into the space and objects surrounding them, including our bodies. Despite the images of control and efficiency conveyed through a beige visual language of intelligibility and smartness, electronic objects... are irrational - or at least allow their thoughts to wander. Thinking of them in terms of dreaminess rather than smartness opens them to more interesting interpretations. Since the invention of radio by Nikola Tesla and Guglielmo Marconi in the late nineteenth century, the electromagnetic spectrum has become increasingly noisy and dense. We communicate through this invisible medium through our electronic devices- radios, cellphones, Wi-Fi, bluetooth, etc. but we do not have direct access to this medium or an awareness of its invisible contours and boundaries. 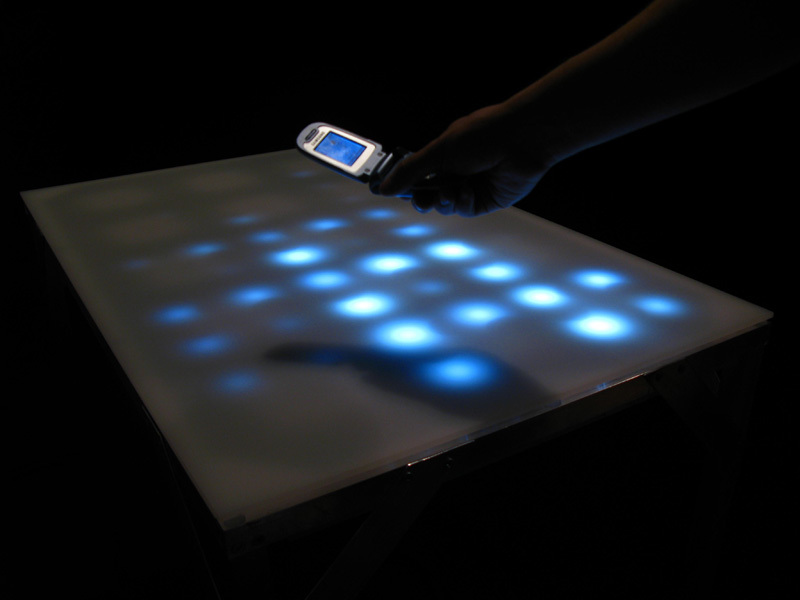 Table for Electronic Dreams was a thesis project by Andy Doro for the Interactive Telecommunications Program at NYU. Table for Electronic Dreams was the Grand Prize Winner of the Instructables Get the LED Out! Contest and was published in How To Do Absolutely Everything by Instructables. For more information see the development blog. For further inquiries please contact mail@andydoro.com. I am interested in using these circuits in other forms and installations. Please contact me at mail@andydoro.com. I would like to thank Michael Chladil, Ellie Davies, Nick Doro, Mike Dory, Nick Hasty, Todd Holoubek, Tom Jenkins, Ai-Chen Lin, Rory Nugent, Despina Papadopoulos, Danny Rozin, Ruth Sergel, Tymm Twillman, Kyveli Vezani, Gian Pablo Villamil, Stefanie Wuschitz, Raphael Zollinger, my family and everyone at ITP. Voiceover by Ellie Davies. Music by Aleph-1.